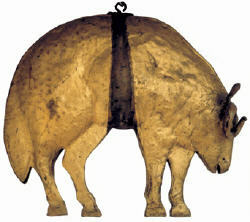 The sign of a carved Golden Fleece, made from beaten and gilded copper, was the traditional sign of a woollen draper's shop. The Royal Charter granted by Charles I in 1625 gave the citizens of London the right to erect signs to identify their trade in this way. The trade sign was an accessible method of identifying a tradesman's premises at a time when the majority of the population was illiterate.